Fermented carrots add a pleasant and sour crunch to stews, crudités, and cheese and charcuterie boards. Lacto-fermented carrots are also more nutritious than raw carrots as they feature healthful benefits such as probiotics. Ingredients you’ll need to prepare fermented carrots. At some point, thousands of years ago, early humans learned to use the process of fermentation to enjoy its tasty results. The most familiar fermented foods, like Korean kimchi, Jewish pickles and German sauerkraut are made using lacto-fermentation. Most people think about beer or wine when they hear the word fermentation. While specialized yeasts are used to convert sugars in grape juice or grains into alcohol, it is tiny bacteria that are responsible for lacto-fermentation. Various strains of these bacteria are naturally present on the surface of plants, especially those growing in or close to the ground such as garlic, carrots, and jalapeños. The naturally occurring bacteria convert sugars into lactic acid. This acid is a natural preservative that inhibits the growth of harmful bacteria. Lacto-fermentation also increases and preserves the beneficial vitamin and enzyme levels, and digestibility of fermented food. 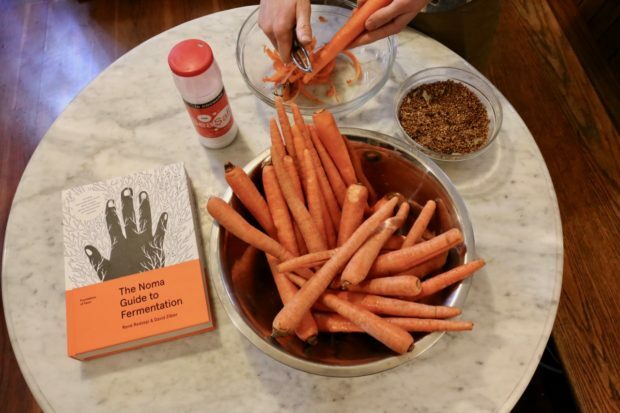 if you’re keen to try fermentation for the first time it’s best to start with an easy recipe. 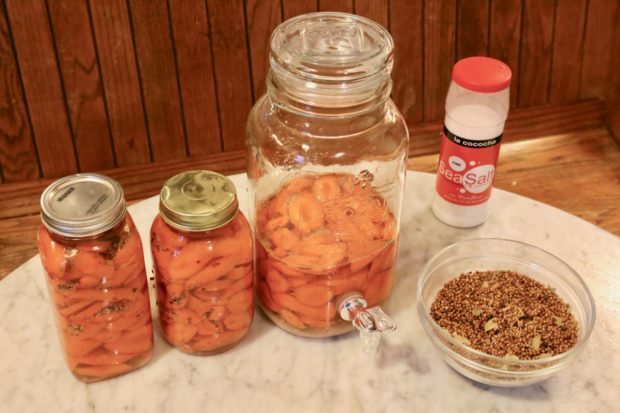 Fermented carrots are one of the easiest fermentation recipes you’ll find. lacto-fermented vegetables are rich in beneficial bacteria, which have been proven to encourage healthy gut flora. 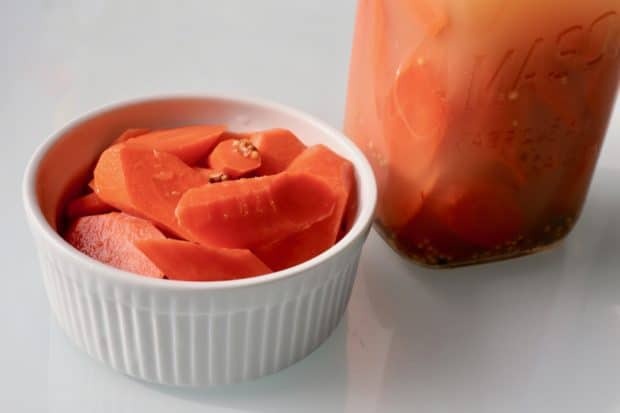 fermenting carrots allows you to naturally preserve raw carrots to enjoy over a long period of time. their subtle sourness and crunch offers a unique flavour profile. Raw carrots waiting for the fermentation process to begin. Dips: fermented carrots are best enjoyed dipped into hummus, guacamole, baba ghanoush or yogurt ranch dip. Cheese and Charcuterie: add your favourite lacto-fermented vegetables to a celebratory cheese and charcuterie board. Salads: top your favourite cold salad with sliced carrots. Stews and Soups: add fermented carrots to your favourite hearty stews and soups. A jar of fermented carrots ready to enjoy after a month long fermentation. do not fill the carrots and brine all the way to the top of the jar. You want to have just enough brine to cover the carrots. ensure the carrots are always submerged under the liquid to prevent mould growth. open your lid each day to burp the jar, releasing a build up of carbon dioxide. This will help you avoid an unwanted explosion in your cupboards. feel free to add pickling spices, fresh herbs, sliced garlic or even jalapeno peppers to add a boost of flavour. at the farmer’s market, purchase speciality carrot varieties such as purple, pink, and yellow to add colourful creativity to your jar. Fermented carrots add a pleasant and sour crunch to stews, crudités, and cheese and charcuterie boards. They also feature healthful probiotics. 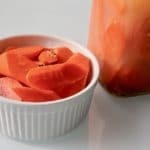 Once your carrots are peeled and sliced add them to a mason jar so they are 1 inch from the top. Prepare a salt brine by dissolving salt in water. Pour brine into the mason jar until carrots are covered. Optional: add any additional flavourings such as pickling spices or fresh dill or basil. Put the lid on the jar and store at room temperature in a dark place like your closet or cupboard. Open the jar once a day to release carbon dioxide. Fermentation fans call this "burping." Continue this process for 3-4 weeks until fermentation bubbles no longer form. Move the jar to your fridge once fermentation has completed and enjoy for the next 3-6 months.